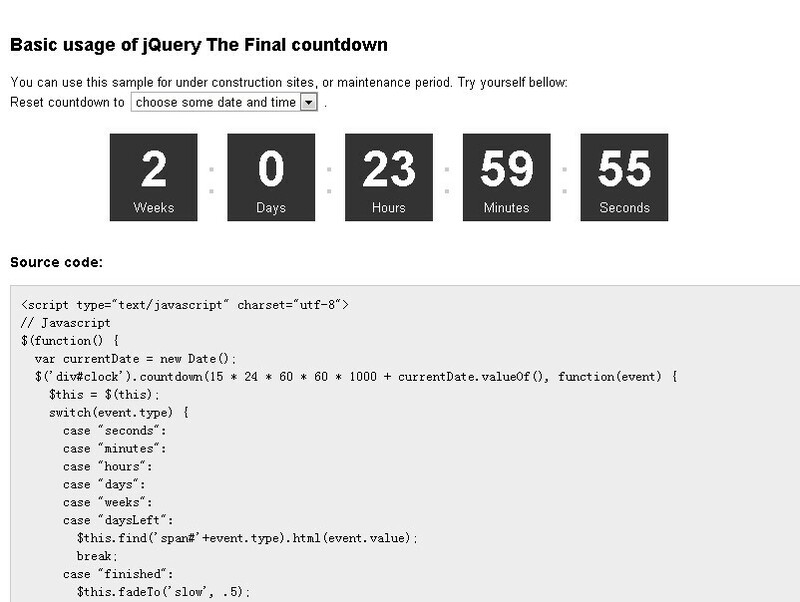 All the Free jQuery Plugins about 'countdown' are listed here. This is a list of 10 best jQuery countdown plugins which can be used to tell the visitor how many dates, times, products left before the event. Enjoy. simple.timer.js is a simple jQuery countdown timer plugin with the ability to execute a callback function for custom behavior on timeout. 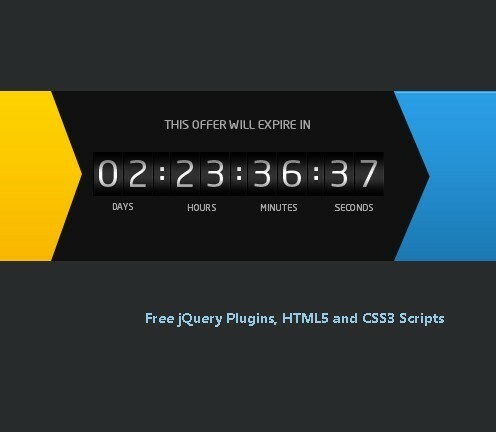 timeTo is an easy-to-use and high customizable jQuery plugin for creating Countdown Timers or Digital Clocks with a lot of options and Callback support. 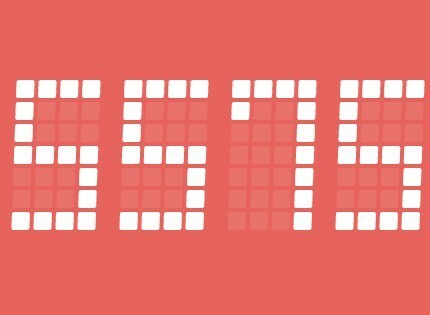 A beautiful, animated, and customizable date countdown timer built with C3counter.js jQuery plugin. 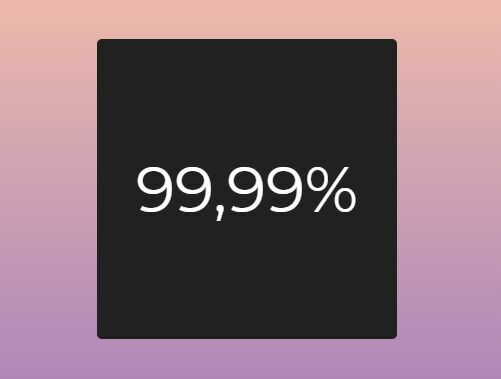 countdownCube is a simple and easy-to-use jQuery plugin for creating a pretty look countdown timer with 3D rotation effects using CSS3 transitions. TimezZ is a very basic jQuery countdown timer plugin which displays the remaining time (in years, months, days, hours and seconds) before a specified date. Just another jQuery countdown timer plugin that counts down in seconds, minutes, hours and days to any date or a given time. Also can be used as a clock that displays current local time. 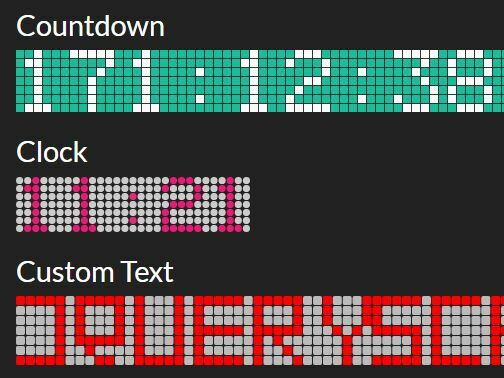 LED.js is a jQuery plugin used to create vector SVG based, LED display style countdown, timer and clock components on your web application. A jQuery plugin for creating an easy-to-style digital clock to count down from a specific date on your coming soon/under construction pages and event landing pages. 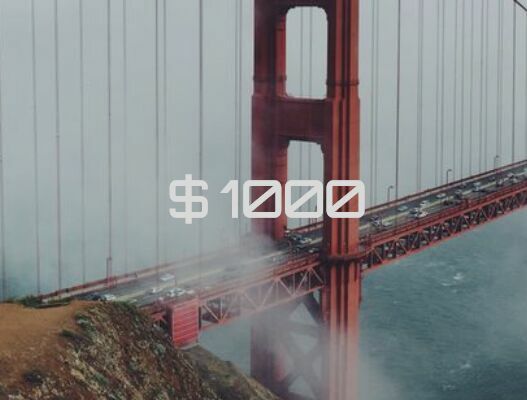 countdown-js is a simple and CSS-less jQuery plugin for creating 7-Segment Display-style digital countdown timers with custom styles and callback functions. 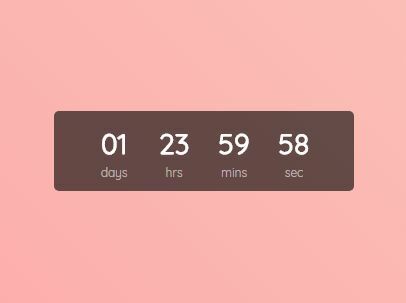 simpleTimer is super tiny jQuery plugin used to generate a simple countdown timer widget that is easy to style using your own CSS and has callback functions support. timer.js is a multifunctional jQuery timer plugin which helps you create countdown timers and stopwatches, as well as dynamically switch between a set of elements at a given timeout. Yet another jQuery plugin for creating a pretty cool, scoreboard style flipping clock to countdown to or from a given date & time. jQuery countdown is a simple plugin for creating a customizable countdown timer which supports standard/compact formats or custom layout. 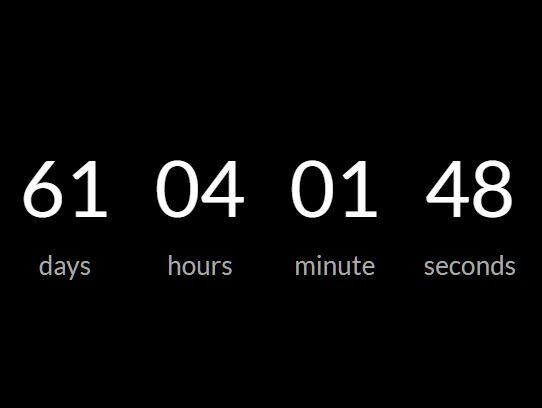 yuukCountdown.js is a simple, straightforward jQuery plugin used to create a timer clock that counts down in days, hours, minutes, seconds and milliseconds to a given date time. 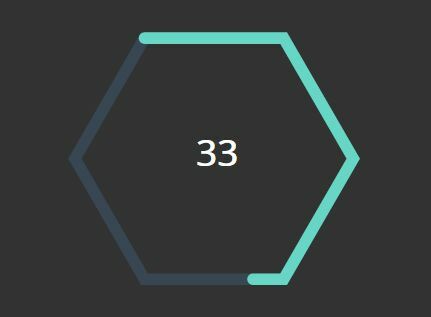 polartimer.js is a jQuery countdown timer plugin which draws an animated, configurable, SVG based circle to represent the remaining time. 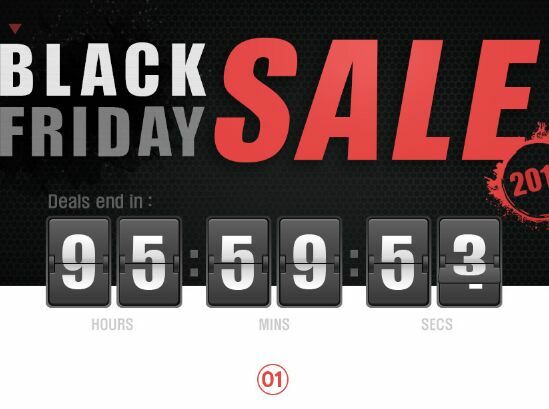 vtimer is a very small (~2kb) and cross browser jQuery plugin used to generate customizable, event-based countdown timers on the webpage. 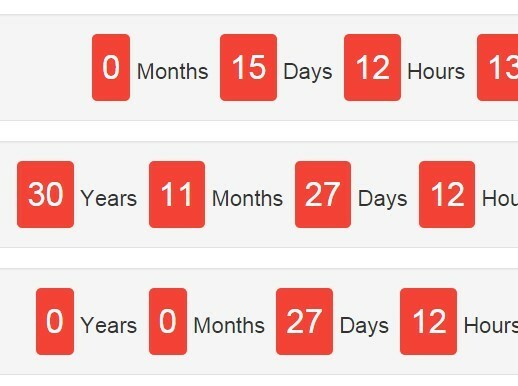 countdown.js is a jQuery countdown plugin which counts down from a specific date and injects countdown elements (ie, days, hours, minutes) into selected elements. 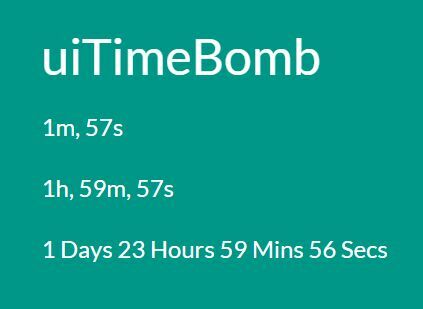 uiTimeBomb is a really simple jQuery plugin that provides a flexible way to create countdown timers with custom output formats on the webpage. Just another jQuery dependent countdown timer with callback support that has the ability to auto pause when the current page loses focus. 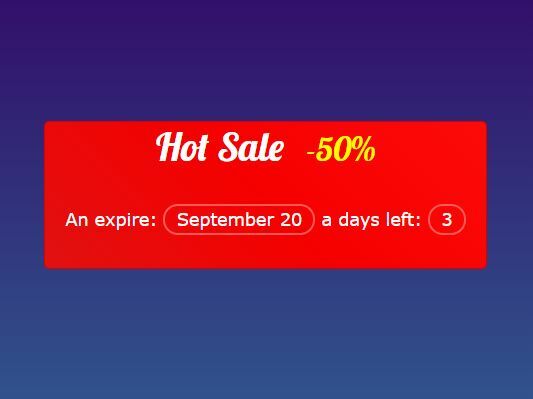 Final Countdown is a simple and abstract jquery Date Plugin for date or time countdown. The SyoTimer jQuery plugin lets you create digital-style countdown / periodic timers on the webpage, with support for callbacks and custom timezone / localization. downtime-timer is a very small jQuery plugin used to create a countdown timer with timezone support for coming soon / under construction pages. Yet another jQuery countdown plugin that displays how many years, days, hours, minutes, and seconds left from a given date/time. 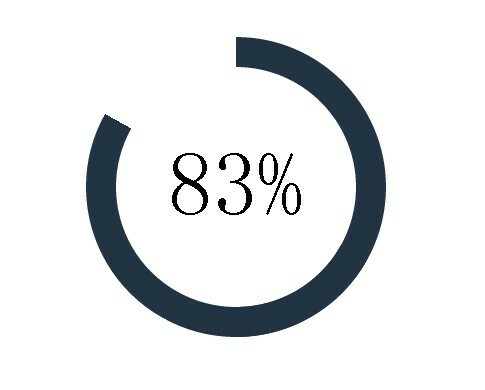 Just another circular countdown timer jQuery plugin which creates an animated countdown clock to present the remaining time. timeLeft is a simple yet customizable jQuery UI widget to generate an inline countdown timer that counts the time left to a date of your choice. 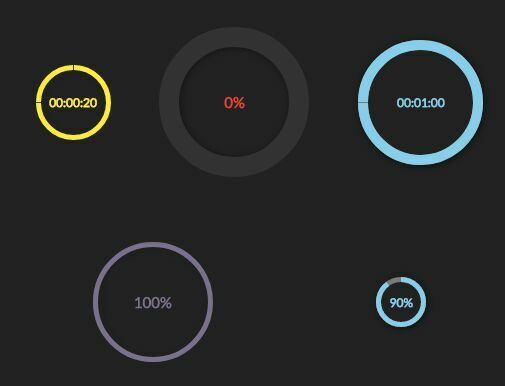 Circle Timer is a very lightweight jQuery plugin that lets you create a SVG-based circular pie-style countdown timer. Digital Countdown is a lightweight jQuery plugin which uses moment.js to create a 7-Segment LED display-style digital countdown to a given date/time. Workout Timer is a jQuery plugin used to create countup timers, countdown timers, interval timers, repeating timers with sound effects for your web applications. 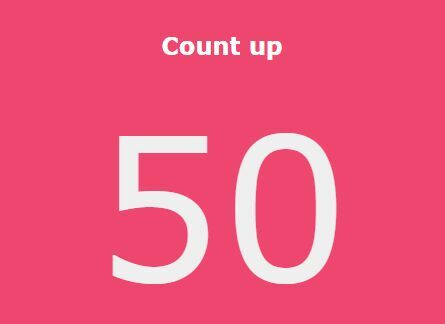 countTo is a simple jQuery count-up and countdown plugin which animates decimal number increment / decrement at a specified speed and step. 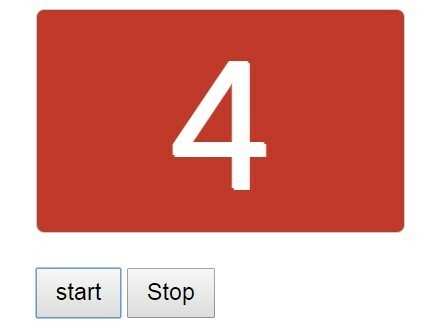 UndoCountdown is a jQuery plugin which helps you create a basic countdown timer inside your action button. 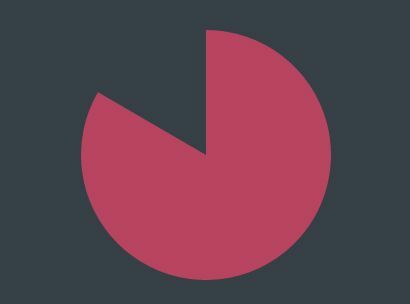 Pietimer is a minimal, lightweight jQuery plugin for creating a circular, Html5 Canvas based pie timer with onComplete callback support. 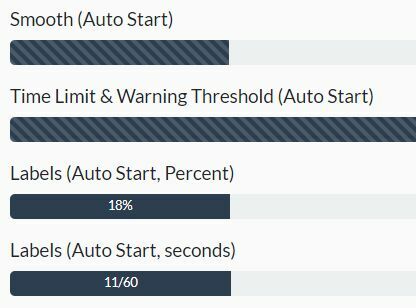 Countdown is a cool and simple jQuery plugin for creating a mechanical scoreboard style countdown timer to display the remaining time in seconds, minutes, hours and days to any date. Countdown Clock is a small plain jQuery countdown timer plugin which counts down in years, months, days, hours, minutes, seconds to a given date. DownCount is a small countdown clock plugin for jQuery that counts down to a specified date time with support for timezone offset setting. 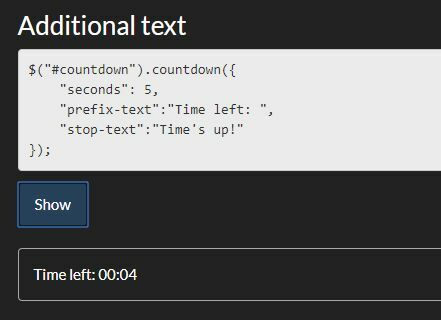 text-countdown.js is a simple lightweight jQuery countdown plugin that outputs the remaining time in a human readable format. 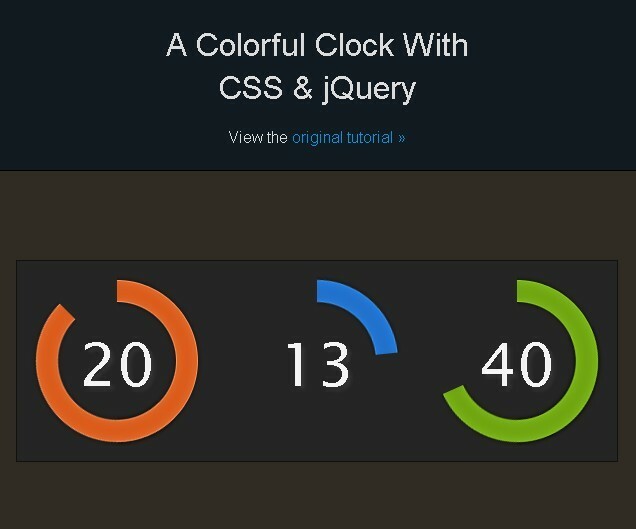 Yet another jQuery countdown timer plugin that creates a CSS3 based circular ticking timer with custom duration and time units. flipTimer is a jQuery plugin which enables you to count down towards or count up from a certain time like a vintage flip clock. 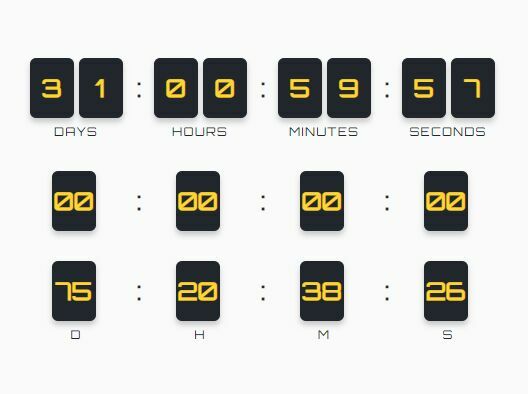 Classy Countdown is a jQuery plugin that makes use of Html5 canvas to render a slick, circular, themeable countdown timer on your web page. ClassyLED is a plugin for jQuery and Raphaël JS library that allows you display a countdown timer, a clock, or a random number in a vector shaped LED display. Tictic is a jQuery plugin that creates a stylish, circular, sweet event ticker to count down the days till your pregnancy. revolver.js is a lightweight jQuery plugin to create a countdown clock that allows you to count down to a certain date. Just another jQuery countdown plugin which allows you to countdown in seconds, minutes, hours, days and years to a target date/time. A simple, easy-to-use yet highly customizable jQuery countdown plugin which helps you count down to any special date/event. runner is a simple jQuery plugin that allows you to create a customizable timer for counting time down or up, similar to a stopwatch. A digital countdown clock which allows you to count down in seconds and millisecond to a target date time, built on top of CSS3, jQuery andrequestAnimationFrame. FlipClock is a jQuery plugin for creating a clock & countdown timer that displays information in a digital format on a split flap display. 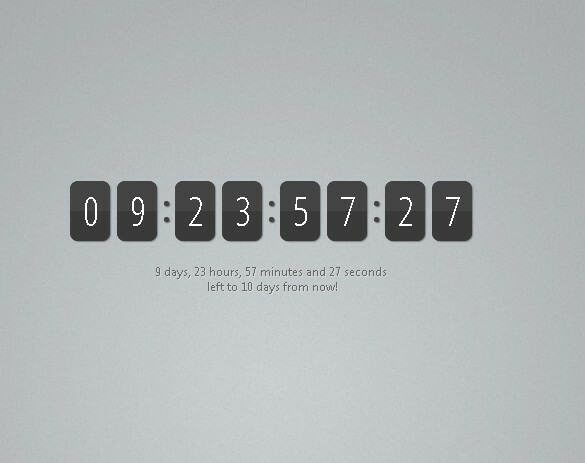 A beautiful and Lightweight Countdown Plugin built with jquery.countdown.js weighs just 1.7 KB. Numinate is a lightweight jQuery number counter plugin that allows to count up or down to a target number at a specified speed. dsCountDown is a simple jQuery plugin for creating a customizable & themeable countdown timer which supports both local and server time (PHP script required). 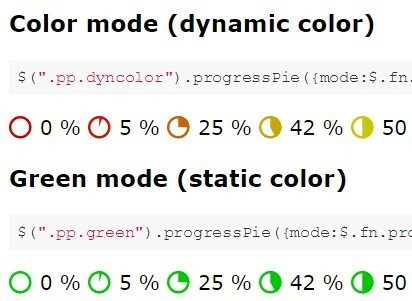 pietimer is a simple jQuery plugin that allows you to create a circular pie graph-like timer using CSS3 and jQuery. 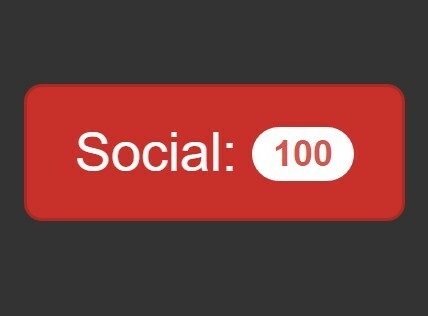 Good for countdown timer or loading bar. 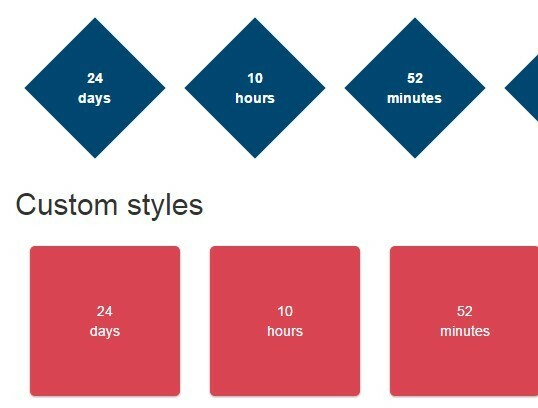 A tiny and easy-to-use jQuery plugin that allows you to create a customizable countdown timer on your web page.